Secondary school students from across the region were plating up and wiping down on Thursday before diving into the next challenge as part of the UCOL Secondary Schools Hospitality Competition. 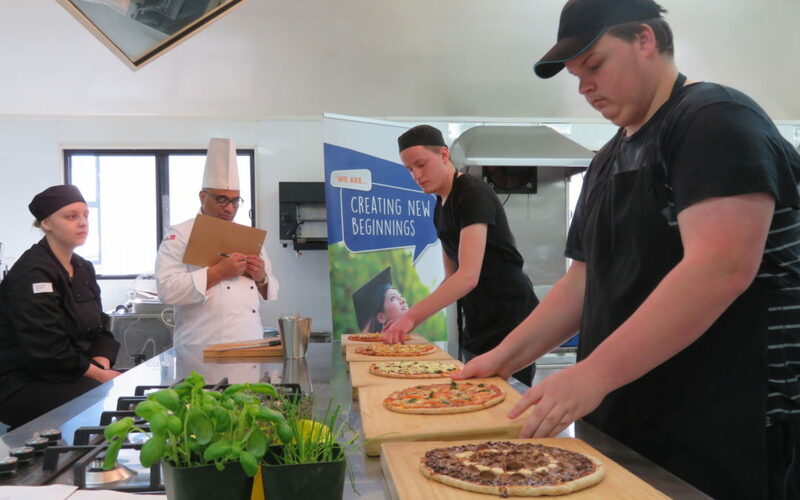 Held at Wairarapa’s UCOL campus, the competition tasked teens with baking, cooking, and making drinks across hospitality events known as classes. It was the last of three competitions, with others held for students in Whanganui and Palmerston North earlier this month. Wairarapa College’s Matthew Payton, 17, said the competition put him under pressure, but that’s when he was at his best. The challenge simulated what it was like to work in a real commercial kitchen, he said. Chanel College’s Benjamin Dotrice, 17, said it was “nice to be pushed to be creative and think slightly out of the box”. Payton and Dotrice were winners for pizza cooking and barista classes respectively, taking home prizes supplied by Wairarapa businesses. Other winners included Abbey-Jade Gunn, who won gold in the cupcake and pasta classes, while Madi Howell took out the mocktail class, and Bailey Rink the bread loaf class. The omelette class was open to teams of two, and was won by Gunn and Grace Croasdale. UCOL senior chef lecturer and judge Ian Drew, said the food presented by the students was of a high standard. “If you saw any of this in the shop, you’d buy it,” he said. Fellow chef lecturer Kiri Macdonald said it was great to see young students thrive in hospitality. She said she looked forward to seeing more students apply for next year’s competition.